pizza peels, pizza baking trays, baking peels, trolleys and much, much more than this. For over 30 years, Gi.Metal has been designing and manufacturing a range of professional tools for pizza restaurants and the catering services which are always available in stock to be delivered to over two thousands distributors worldwide. 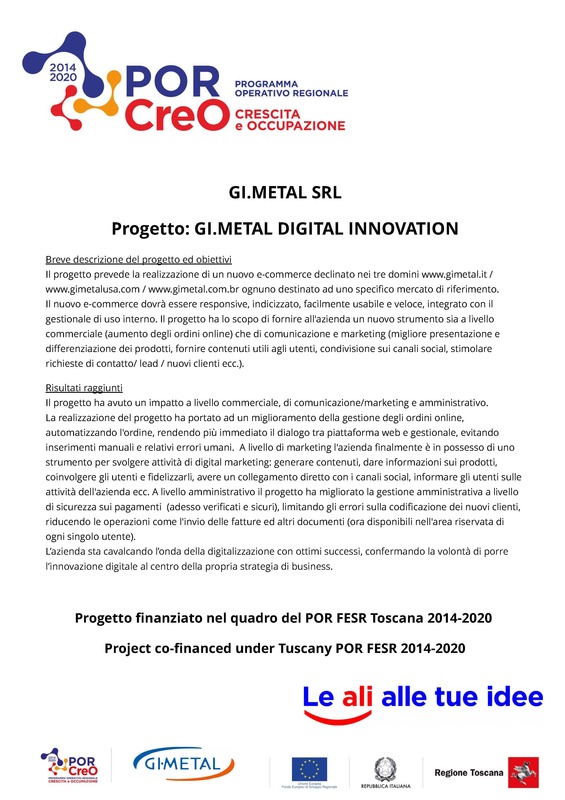 Gi.Metal is an Italian company based in Montale, in the district of Pistoia, with two subsidiaries abroad: one in the United States, in Chicago, and one in Brasil, in Curitiba. The company mission is to co-operate with professional and amateur pizza makers, understanding their needs, the specific issues linked to their work and developing efficient solutions aimed at enabling them to work better, faster and in a more productive way. Gi.Metal produces over 600 items for pizza restaurants, restaurants and catering services. Their products are 100% Made in Italy: synonymous to quality, functionality and beauty. More specifically, Gi.Metal products range includes: pizza peels, pizza baking trays, baking peels, pizza cutters, spatulas, dough cutters, oil dispensers, but also restaurant trolleys. Production processes and raw materials used are consistently tested and updated so to achieve the highest standards of functionality, comfort, solidity and safety, as testified by the ISO 9001:2008 quality certification awarded by TÜV Italia. Gi.Metal philosophyis to partner up with both professional pizza makersand amateurs so as to understand their peculiar requirements, create a range of dedicated solutions, manufacture them and distribute them globally. The company is driven by three fundamental factors: quality, passion and innovation. A consistent research into innovative raw materials, the attention and the deployment of resources aimed at developing refined and efficient processes, have allowed the company to continuously improve their products up to the level of excellent they are so proud of. Every year Gi.Metal takes part in over 20 international trade fairs in the world to take advantage of the opportunities such events can offer to start off new negotiations, develop new markets, interface with customers and final users. We are talking about events such as Host & Sigep, two of the most important events at a national level, and also Parizza held in France, European Pizza & Pasta Show held in London, Alimentaria held in Barcelona, and even Pizza Expo held in Las Vegas, NRA held in Chicago, Pizza&Pasta Northeast held in Atlanta, Fispal held in Brasil, Alimentec held in Columbia, Pir Expo held in Russia, Saudi Horeca, Gulfood, Gulf Host held in the Emirates, Sial held in Indonesia, Fine Food held in Australia, and finally FHC held in Shanghai and Pizza & Pasta Expo held in Japan, two of the newest markets. Furthermore, Gi.Metal sponsors several national and international events, pizza festivals, online and offline contests and has established some fruitful partnerships with organizations, associations and schools and supports those professionals who work to promote high quality pizza in the world.